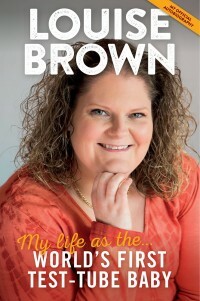 The birth of the world’s first test-tube baby – Louise Brown – has been ranked alongside the moon landing as one of the most significant events for mankind in the 20th century. Louise’s birth on 25th July 1978 was the catalyst for IVF (in vitro fertilisation) techniques that have revolutionised fertility treatment. Now Louise has revealed the impact that being born a celebrity has had on her life and that of her family. Her autobiography, ‘My life as the world’s first test-tube baby ’, tells of her life growing up in the media spotlight and of her lifelong connection with the IVF community. Louise’s autobiography, ‘My life as the world’s first test-tube baby‘, was launched on Friday 24th July 2015 at Bourn Hall Clinic, the world’s first IVF clinic established by the pioneers of IVF Steptoe and Edwards after the birth of Louise. See more about the history of IVF here. Find out about Steptoe and Edwards and the history of Bourn Hall here. Visit Bristol Books to see more about Louise’s autobiography.